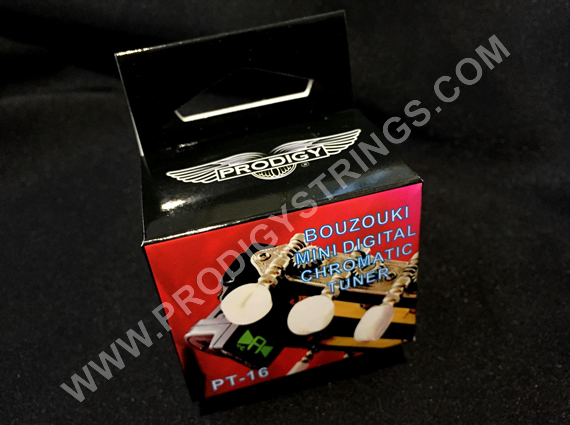 This is the most popular type of chromatic tuner available. The PT-16 is small and easy to use. Very precise and accurate tuning! 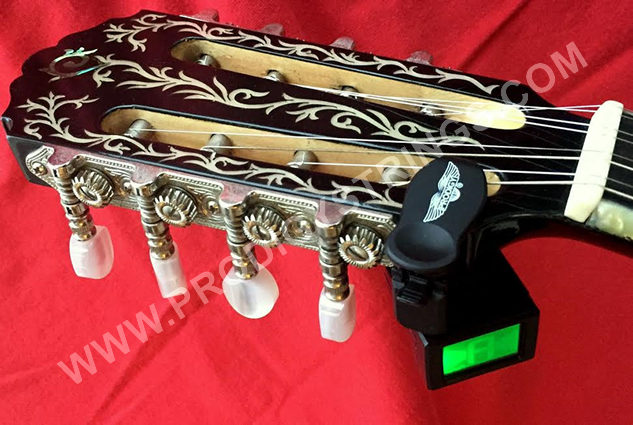 This tuner is attached to the back of your Bouzouki headstock (can be used in 3 different positions see photos) and is hidden from your audience. Simply attach the tuner and adjust the screen so only you can see it. Operation is easy with only the one button for ON/OFF and selecting the tuning frequency. ‘A’ 440 is recommended, the standard tuning concert pitch. Retractable neck allows 360 degrees rotation. 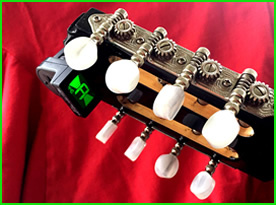 This tuner is also a great tool to use for beginners and students who are learning the notes of the Bouzouki. 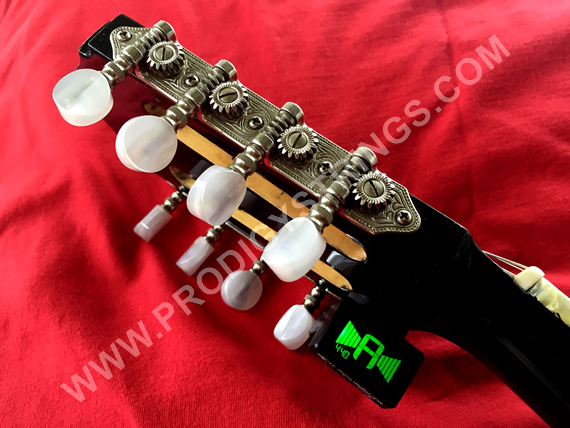 The notes are displayed on the tuner as you play, helping you learn the fretboard much quicker. 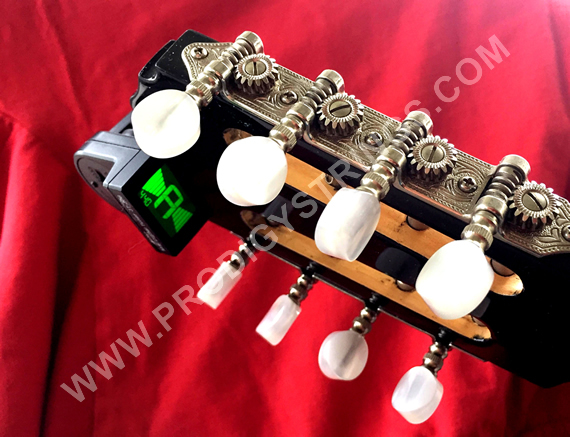 This tuner is also perfect for tuning other string instruments such as guitar, mandolin etc. 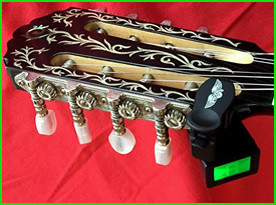 The tuner is small enough for you to attach it to your instrument and leave it on. You can store your instrument in its case without having to remove the tuner. To save batter life, the tuner automatically powers off after 3 minutes when not in use. This tuner MUST be clipped to your instrument to tune. 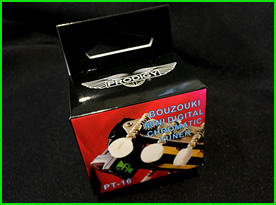 The Prodigy PT-16 tuner comes boxed and supplied with an instruction manual and a CR 2032 battery. 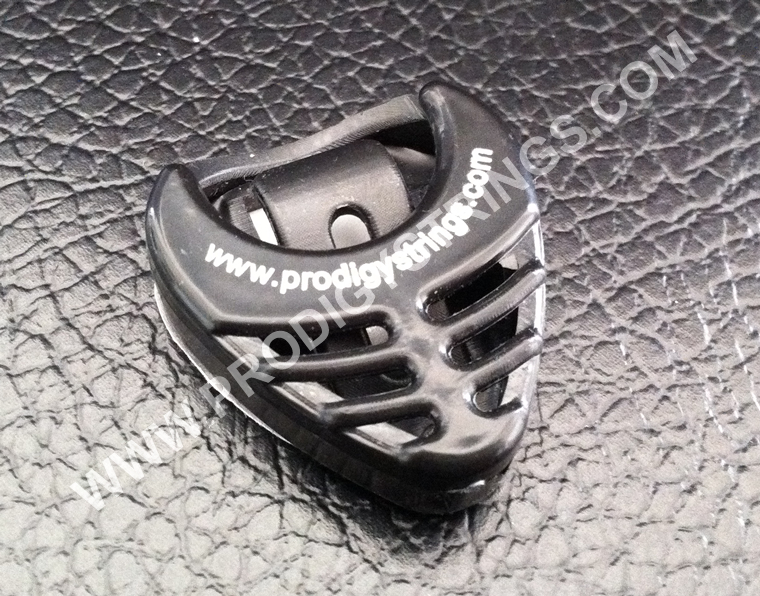 Prodigy Strings® plectrum holder size: 30mm x 35mm. A very thin self adhesive tape (which will not damage your instrument) is on the back of the plectrum holder. Stick to the back of your instrument’s headstock. 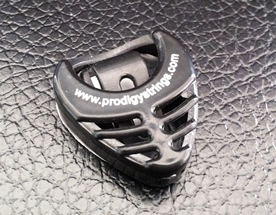 The plectrum holder can store up to 6 medium ‘Laikh' or ‘Klassikh ' plectrums. Please remember to stick in a position leaving enough space for you PRODIGY PT-16 Tuner. Never be without your plectrums! 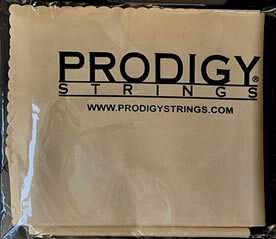 The Prodigy Microfibre Polishing Cloth 30cm x 30cm is a quality, long lasting, robust yet rich soft cloth, which is highly absorbent, attracting dust and dirt far more effectively than an ordinary polishing cloth. Most importantly, the floral edge design on the cloth will not scratch or smear when you dust or polish your instrument. The microscopic fibres of the cloth are 10 times finer than silk, up to 30 times finer than cotton, and 100 times finer than a human hair. The cloth is produced by these fibres being woven into masses of fine tiny hooks & loops which have the amazing ability to cut through and absorb dirt, smudges and micro particles. When your cloth needs cleaning just wash in mild detergent and water, rinse out and hang to dry. © PRODIGY AUDIO SYSTEMS LTD., ALL RIGHTS RESERVED.